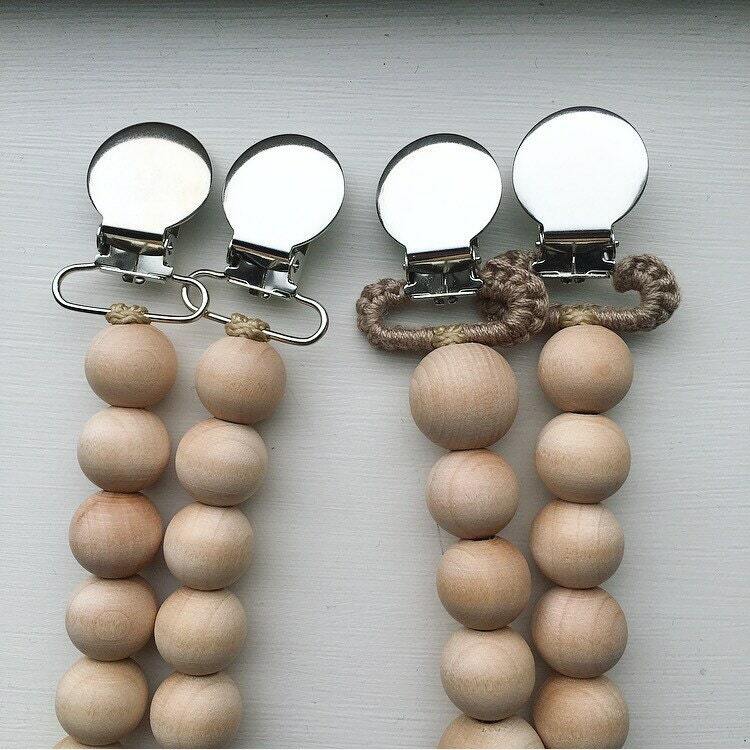 Keep your baby'a pacifier and teether close and off the floor at all time with this wooden beads pacifier clip. Give your baby something to teeth on during those teething moments when they just need to chew! 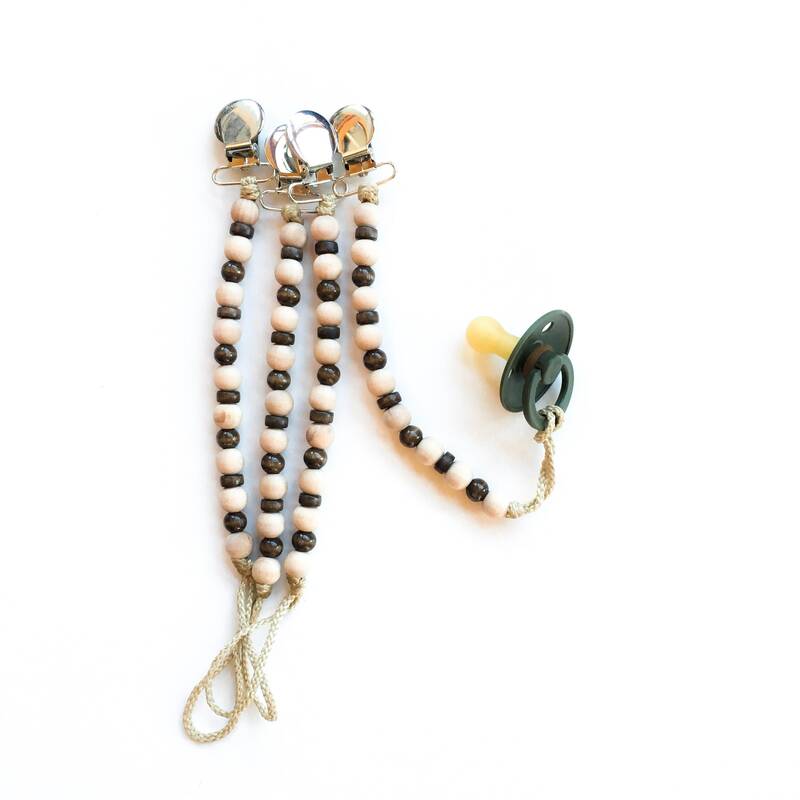 Attach to clothes, blankets, toys, strollers, or car seats, to hold pacifiers, teething rings, or toys! *The parts are all well fixed but because this is an accessory piece, use under adult supervision. 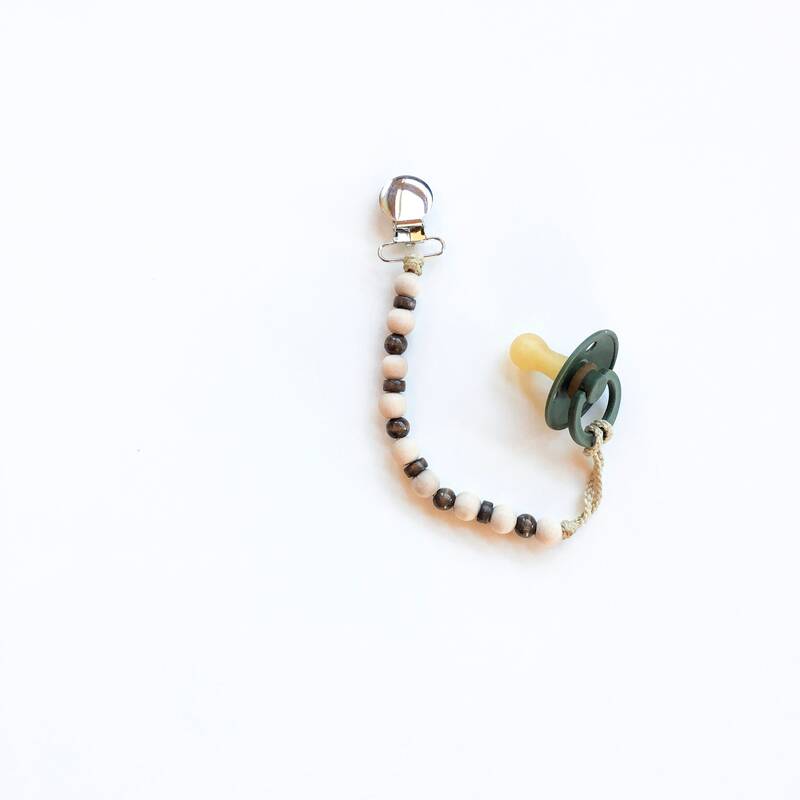 *Do not leave child unattended or sleeping with the pacifier clip. *Pull on clip occasionally to check that it is secure. *Because of computer monitor settings, colors may vary. INTERNATIONAL ORDERS: regular 10-14 day turnaround with a 1-2 week shipping (depending on location and customs). If package is held up at customs, we are not responsible for custom fees. If package is returned from customs due to not paid fees, we are not responsible for those charges. INTERNATIONAL ORDERS PLEASE SEND A MESSAGE OUR WAY WITH THE ADDRESS THE PACKAGE IS SHIPPING TO SO WE CAN HAVE A CONFIRMED ADDRESS ON FILE. When each order ships, tracking information/confirmation is sent out via email. Please make sure that your address is correct and current, we are not responsible for incorrect address information. If your package ships to an address that is incorrect provided to us by you, please reach out to us for more information on how to proceed. If address provided is incomplete, we will reach out via email and Etsy name provided to get the complete address. If there is not reply within 7 days, we have the right to cancel the order. Due to all our products being handmade and made to order, we hold our no returns policy. If your item is damaged upon delivery or you are delivered an incorrect/incomplete order, contact us within 7 days of receiving your package and we will try our best to work through it with you. LOST PACKAGES: if your package is lost in the mail, contact us for more information and instructions. Our main goal is to make you happy, so do reach out with concerns or thoughts and we will do our best to get back to you! Custom Orders are welcome, so if you can't find something that you really want, feel free to message us and we will work with you! If you see an item in my shop and would like to add something else to it that is currently not offered, contact us and we will work with that as well! WHOLESALE orders are welcome. If you are interested in wholesale, please contact us via email at NomiLu@outlook.com.